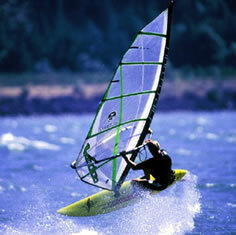 Modern day windsurfing gear has changed greatly since windsurfing first became popular in the late 70s early 80s. 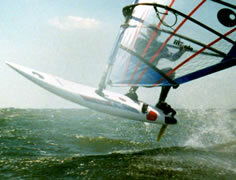 Light wind and beginner windsurfing boards are much shorter and wider than the original One Design boards. While the new designs offer more stability for easier learning, they can nevertheless carry a lot of speed when sailed properly in lighter wind conditions. High wind boards have developed into ultra-lightweight, high-speed rockets; in high winds, foot straps make handling and maneuvering easier. Windsurfing sails have likewise changed dramatically since the days of triangular nylon sails that lost their shape and spilled too much air. 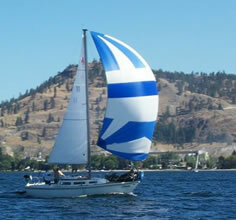 Modern sails provide maximum performance in any wind condition, thanks to computer-designed panels made from space-age materials including Kevlar and Mylar. Adjustable, carbon fiber masts and booms accommodate different sail inventories – weapons in a high performance sailor's arsenal. 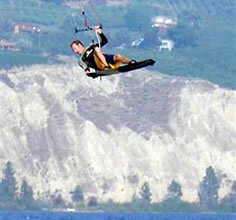 Kelowna’s local windsurfing/kitesurfing action is typically focused around Rotary Beach along Lakeshore Road. On almost any day of the year, when the wind is blowing hard, windsurfers are out there. The best place to windsurf is south of the bridge, where the most desirable (and predominant) wind is a 10 to 15 knot southerly or southwesterly. Under these wind conditions, the lake rollers can get really large and hammer the eastern shoreline. In summer, it’s easy to spot windsurfing gear at waterfront homes and cottages, its owners anticipating a quick sail when the wind picks up. 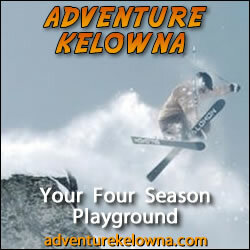 Check back soon for for new wind surfing updates, photos and videos. 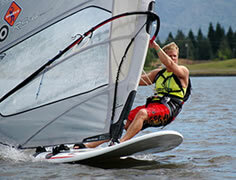 In this section of the website we have information on sailing and kiteboarding.